Nanotec Systems of Tokyo in Japan is a company that makes ordinary things perform extraordinary feats. How about the Nespa optical disc enhancer? It is a remarkable device that uses a strong flashlight to permanently enhance the quality of either sound or image from CD or DVD. The exact workings are still not fully understood (or divulged) but the results are undeniable. There the company uses light to get things right. Another product is a cleaning agent for the automotive industry. Nanotec enhanced normal water in such a way that HO2 molecules can get between the object and the adhering dirt easier and detach it without the need of a chemical agent. Along the same conceptual lines -- using something simple to do a tough job -- is the use of a colloidal liquid on an audio cable. By suspending a certain amount of microscopically tiny gold and silver particles in an oily substance and then applying this oil on a copper conductor, Nanotec found a way to improve performance. The particles range in size from 3.5 to 8nm. One nm is 10−9 meter. For the binder they used the oil from the liver of a deep-sea shark. A welcome characteristic of this oil is its ability to bind oxygen. For the shark it is essential because it swims in deep waters where oxygen is limited and every molecule of it counts. When applied to a copper wire, the oil prevents it from oxidizing. Thus a combination of oil and precious metal particles applied to a copper core will not only prevent deterioration but also enhance the skin effect. Using a colloidal instead of either a solid coating, cladding or compound alloy simplifies the manufacturing process and makes the final product more affordable. 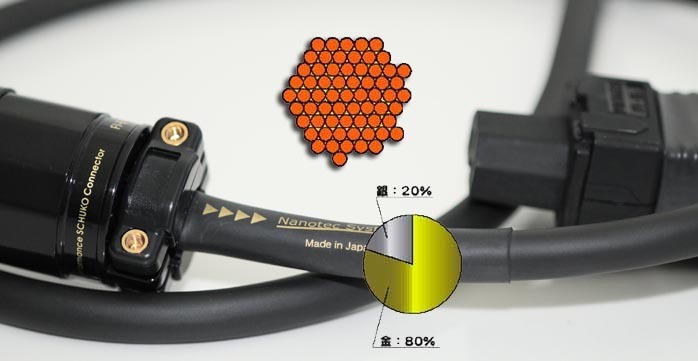 In a series of prior reviews of Nanotec's interconnect cables and loudspeaker cables, we had the opportunity to compare versions of the cables with different ratios of the gold and silver particles suspended in the liquid. We found that when this liquid contained more than 50% of silver particles, a harsher, brighter tone resulted at the end. Using a majority of gold particles made the sound very warm. Nanotec found that a ratio of 80% gold and 20% silver particles created the best and most musical results. By adding more precious metal particles to the oil suspension, a further sound improvement was obtained. After their foray into colloidally enhanced interconnects and loudspeaker cables, the Japanese company now markets its power cords using the same technology under its PVC sleeve. Compared to the previous version of the power cable, the new Golden Strada #302 nano3 Power Cable uses the same colloidal liquid as the other nano3 cables. 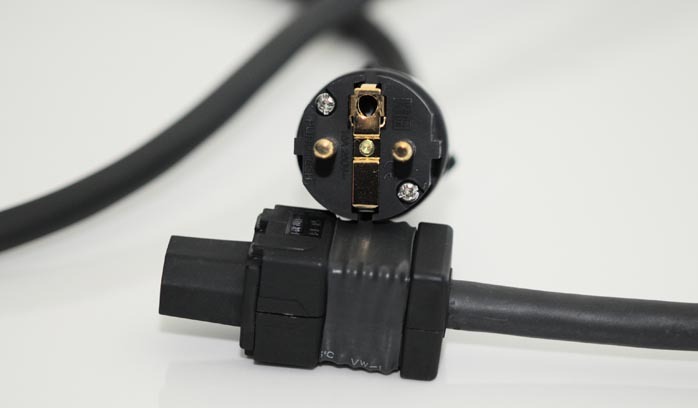 In a further distinction from its power cord predecessor, the diameter of the conductors is enlarged to 0.26mm. Each of the three wire cores is built from 64 conductors to add up to 12 gauge. The cable is available in bulk and in terminated lengths. We received a sample of 1.80 meter terminated with a Furutech Shuko-type FI-11(G) plug and a FI-15 EIC plug at the other end. Both plugs are gold-plated. As with all Nanotec cables we have received to date, the packaging was excellent. Once unpacked, the cable felt solid and flexible enough. The black PVC mantle is imprinted with directional information -- handy in case of using the cable off the reel -- and there is a plethora of safety regulations which the cable conforms to. The first trial for the cable was to replace a generic 50-cent power cable we used for an hour to set our ear standard back to zero. No power regenerator or any filter inserted between the wall and the particular CD player we picked as the test victim. With the generic cable in place, the sound was 'hifi'. Nuances vanished, wood became chip wood with lots of hard glue in it. Once the el cheapo cable was replaced by the Nanotec, the sound we had in mind returned instantly. Wood was nice and warm again, brass was dynamic and well balanced, bass formed a strong and solid foundation. Then we repeated the experiment with our Meishu integrated amplifier. While the 300Bs are mostly idling with our 107dB high sensitivity horns as their load, it was quite a surprise to go back to a generic power cord. No black background anymore but something dark ash grey as it were. Also the image no longer was as rock-stable as before. All the missing bits returned again with the GS #302 nano3 in place. And more. We gained an impression of coziness, as though someone had lit a few candles, poked up the fire in the fireplace and was now making hot cocoa. By this we do not mean that things got overly warm, just pleasantly comforting. The cord stayed for a long time on our AudioNote amplifier. This power cord is not the cheapest on the market but does have distinctive merits. Perhaps the fact that it is unshielded is partly responsible for the pleasant outcome. While what hides beneath the PVC is just a combination of very simply ingredients, they clearly conspire to doing something complex: helping make music sound more real in your house. Quality of packing: Well packed in a double cardboard box. Reusability of packing: Reusable several times. Quality of owner's manual: N/A. Website comments: Very basic and in Japanese, English version still under construction. Human interactions: Very friendly and quick. Pricing: Not the cheapest on the market but special.